Walking through the Little Dry Run Wilderness is a journey into the past. Located just east of Wytheville, Virginia in the Mount Rogers National Recreation Area, this wilderness was established in 1984. 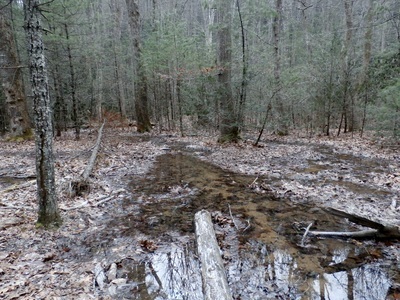 It is one of the smallest wilderness areas in Virginia. However, its small size (2858 acres) does not take into account its importance on the landscape. Little Dry Run Wilderness includes the entire drainage of Little Dry Run. The watershed begins with a small bog at 2800 feet and gently descends about 2.5 miles to the confluence with Dry Run. The elevation at the confluence is approximately 2600 feet. The result is a protected cove with stands of tall White and Red Oak, Tulip Poplar, White Pine, Frazier Magnolia and Hemlock. 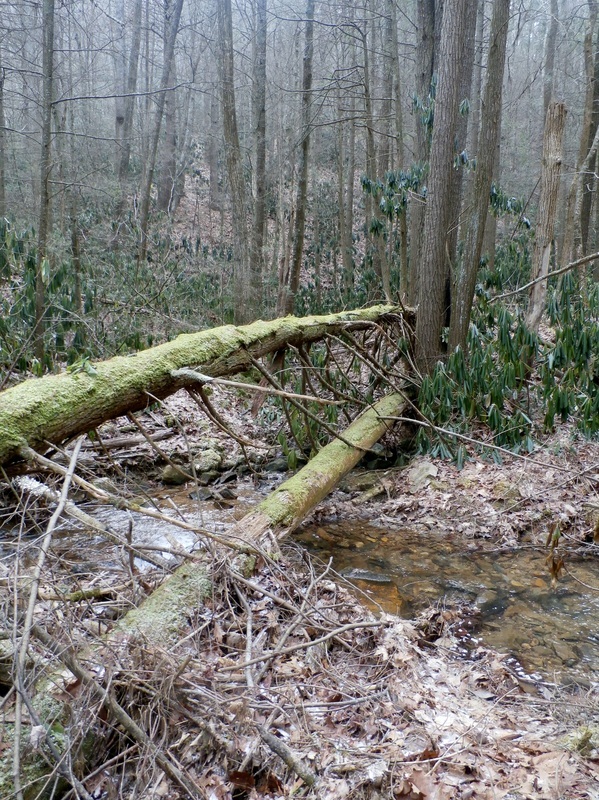 As the Hemlocks slowly succumbs to the Wooly Adelgid on the George Washington National Forest and parts of the Jefferson, they continue to survive in the sheltered drainage of Little Dry Run. The trees, tall and straight, with crowns high in the canopy, serve to remind us of their once major role in protecting streams from temperature extremes and erosion. Due to this protective cover, Little Dry Run is home to native Brook Trout. 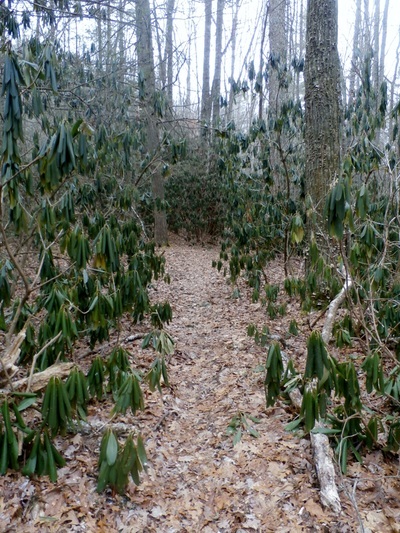 The southern boundary of Little Dry Run is defined by the Virginia Highlands Horse Trail. This trail climbs through the Jones Run watershed to a high saddle before descending down the Dry Run drainage. The Little Dry Run Trail intersects the Horse Trail in the saddle. 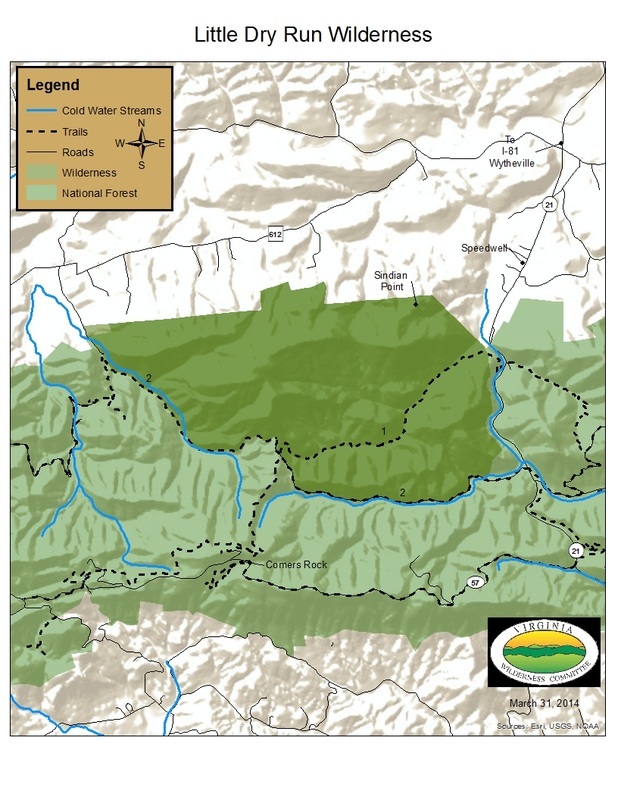 Both creeks are recognized as cold water streams by the Virginia Department of Game and Island Fisheries. Several ephemeral streams drain into Jones Run. Unlike Little Dry Run, these small streams, lined with thick stands of rhododendron, flow quickly through steep narrow drainages. Some of them are paralleled by old road and provide limited and often difficult access into Little Dry Run. Sindion Point, a small knob in the northwest part of the wilderness, is the only named landmark within the boundary of the Little Dry Run Wilderness. At 3000 feet, it marks the end of a long ridge that runs through the heart of Little Dry Run. The ridge is wide and easy to follow. However, the climb to crest is difficult. Stands of yellow pine and Chestnut Oak dominate the ridge. An unnamed peak (3614 feet) is the highest point in the wilderness.